Bravery is bigger than just heroic, life-saving feats or bold, fearless ventures into unchartered territory. Courage is what happens every time you swallow that nervous feeling in the pit of your stomach and forge ahead, anxiety and all. You tap into your inner bravery whenever you commit to going full speed ahead in your everyday life, in spite of the fact that you might fail or might be disappointed in what happens next. You’re your own kind of superhero when you decide to break outta the comfort zone that keeps you in an uber-typical routine. … you belt out your favorite song in the car, even though your kids make fun of your singing voice. … you call a friend you’ve lost touch with, even though you know the falling out was probably your fault. … you go out on a limb and try an Exhilarate class online, even though Invigorate is usually more your style. … you boldly ask for what you really want out of a relationship, instead of quietly accepting the status quo. … you go after the raise you know you deserve, even though your boss is a notorious stickler. … you finally go blond (and again when you decide it’s time to go back to your natural color). … you apply for that job you’re not quite qualified for, and when you admit to the hiring manager that you still have a lot to learn. … you rock a pair of booty-hugging yoga pants, no matter your previous hang-ups about your bod. Opportunities to be brave present themselves minute after minute, and day after day. 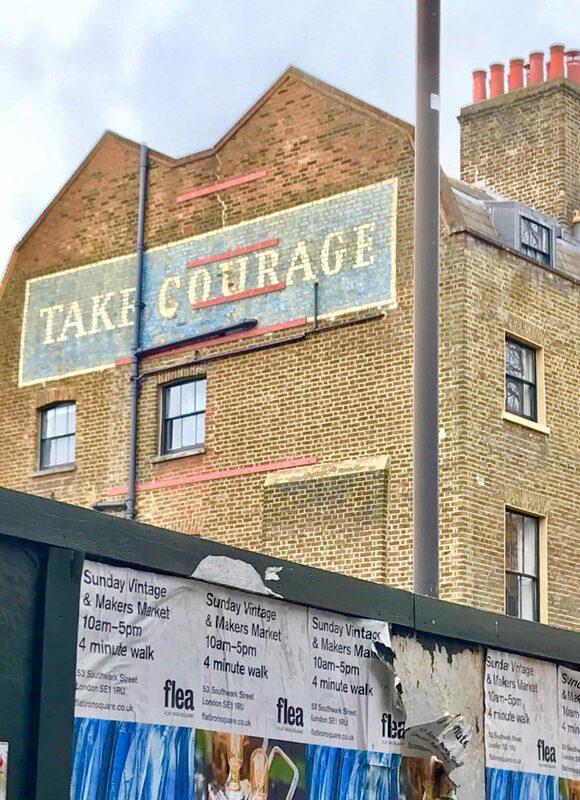 It’s up to you find them, grab them, and take advantage of them — even if whatever city you happen to be in doesn’t have an awesome TAKE COURAGE billboard like the one above, which we found in London (the home of all our favorite graffiti). We bulldogs are here to push each other to do just that. Next time you’re wondering whether or not you have it in you to exit your comfort zone (spoiler alert: you do), crank up your favorite tunes and remember that your bulldog fam has your back. You’ll take that scary step and turn it into a flying leap. Trust us. How do you show courage in your daily life? Tell us on Facebook + Twitter!